My Favorite 360 or so…. J-Pop Songs of All-Time (Vol. 5) | モーニングBerryz48…the morning after….. "Always wear protection before reading…(^q^)." Remember your very first love? Going back to my record store days I was never one to shy away from the unknown when it came to music and that’s precisely how I came across the pop~tastic music of Morikawa Miho, and when I stress shy and the unknown I must also toss in there no fear as you can’t imagine my surprise when my very first J-Pop album purchase was priced up into the $30 range or so =O! I mean it was pretty much twice the cost of any domestic single disc release here and yet with no fear I dove in and purchased it anyway!! Now many moons later I can honestly say that it was a very good thing that Morikawa Miho’s album “Voices…” totally blew me away!!! As this album would single handedly lend to my investing so much more of my attention into J-Music in general and the culture of it all as I was from then consuming as much of it that I could get my hands on =). So as you can see one Morikawa Miho album led to another and then another and so on and so forth~! So today I’m going to be solely focusing on my aforementioned very first J-Pop album purchase, here with four select songs which definitely make my top “360 or so…” and more specifically these are all in my top 100 favorite J-Pop songs of all-time. (sigh…) my very first J-album purchase, and so these songs REALLY hold extremely high sentimental value for me personally. 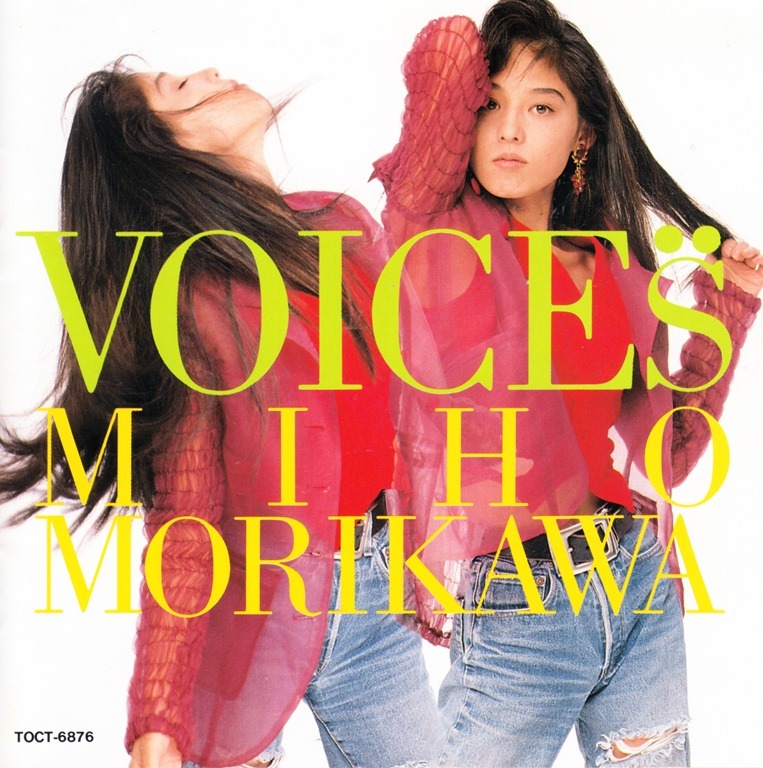 Morikawa Miho’s album “Voices” was released on December 9th, 1992 and it’s a “best of” album compilation actually, and that’s something I wasn’t aware of back when I purchased it as it was just there sitting on an overstock shelf…. by no means a new release or even a featured item at our local record store as this album had been out for a few years before finding its way into my life. Now the first thing to hit you is Morikawa Miho’s oh~so~immaculately powerful vocals as hers are firmly atop that top tier of voices in the J-Music world and beyond as this girl has some of the most amazing vocal pipes!! She has the total vocal arsenal of range, nuance, strength and uniqueness and all of her releases throughout the nineties present an pretty age defiant aura of pop music/r&b/dance as they’re not the type to easily fall into any dated traps by means of their production or instrumentation styles. Still it’s undeniable nineties~love here and for today I’ve chosen four songs from her “Voices” album (compilation album) all of which are bright and richly produced pop numbers. In Morikawa Miho’s later years her influences from being abroad lent to a much more R&B tone but one thing remained for certain…. that voice is purely amazing and one of the very best which can go up against the best of them in the biz~. Morikawa Miho brand of power~ballad as it’s not your typical slow lullaby but rather a highly energized pop song which engulfs the listener in a gorgeous wave of contemporary jazz elements reminiscent of GRP record’s glory years of the likewise nineties… all the while staying true to its pop roots. Morikawa Miho’s voice forges a powerful melodic tone which never plays second fiddle to the beautiful orchestration of instruments below. Morikawa Miho’s much celebrated anime tie-in song is none other than a theme from the iconic anime series Ranma 1/2!! Many will readily recognize that infectiously funky pop soul which pops with jazz themes which is nothing short of “Positive.” And would anyone like any cheese with that last thought =)?! This one’s a love at first listen level of song~!! Gallery | This entry was posted in J~Pop, My Favorite 360 or so…. J-Pop Songs of All-Time and tagged blue water, favorite songs, j-pop, morikawa miho, positive, tsubasa ni kaete, yes i will. Bookmark the permalink. Hi Gregory! Wonderful to meet a fellow fan of Morikawa Miho’s music and thank you so much for sharing~♡ one of your favorite songs too! She has an amazing voice doesn’t she, and her brand of pop/R&B have done well in standing up in time as her sound and style hasn’t suffered any dated feeling to them =). Again thank you for chiming in ^^.